Pakistan has suspended moves to close the national branch of the charity Save the Children. 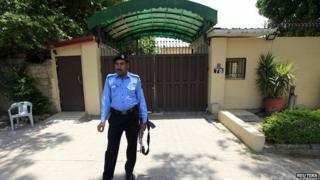 The move by the interior ministry comes days after the charity's main office in the capital Islamabad was shut down by police. No formal reason was given for the action and there has been no official comment on the reversal. Officials have previously accused the charity of involvement in "anti-state activities". Pakistan had linked the charity to a fake vaccination programme used by the CIA to track down Osama Bin Laden. Save the Children has always denied being involved with the CIA or Pakistani doctor Shakil Afridi, who carried out the programme. A Save the Children spokesperson told the BBC on Sunday that the charity welcomed the government's decision. About 1,200 Pakistanis work for Save the Children, but no foreign staff have been in the country for the past 18 months. Speaking after the charity's offices were shut last Thursday, Pakistan Interior Minister Chaudry Nisar Ali Khan said NGOs were operating beyond their remit with backing from US, Israel and India. He said local NGOs that used foreign funding to implement a foreign agenda in Pakistan "should be scared". Save the Children said at the time it "strongly objected" to the closure and it was "raising serious concerns at the highest levels". The US State Department also expressed concern over the closure.